Viejo Coffee: a new way to drink iced coffee. Miner Market is a venue for our advertising partners. (From left to right) Ricardo Silva, Miguel De La Rocha, Jose Avélos are co-founders of Viejo Coffee. After spending four years in the process, this September, Viejo Coffee will open its doors to the community at International Bar in downtown El Paso. Owners Jose Arevalo, Miguel De la Rocha and Ricardo Silva, spent the past four years learning about the fundamentals of coffee to open their own coffee shop. One thing in particular that makes Viejo Coffee unique, besides their iced horchata latte, is the way they serve their drinks in plastic bags. 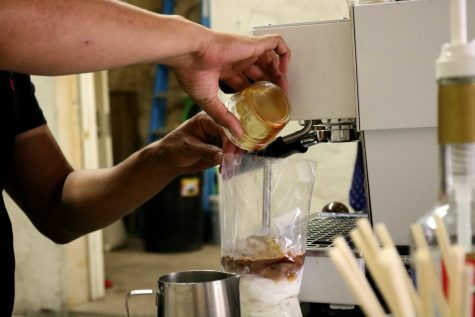 Miguel De La Rocha prepares an ice coffee in a bag. De la Rocha said that in the beginning the theme of the bag was supposed to be their logo, but it later turned into their main thing. According to De la Rocha, both, the plastic bags and the straws are made of bio-degradable elements. The bag being plant-based and the straws are made out of avocado seeds. Besides opening a coffee shop, Arevalo and De la Rocha own the Roasted Corn Bus. At the start, naming their new project Roasted Coffee Beans was an option to match it with their food bus. However, they found that “Viejo” would have a much emotional meaning to them. After Miguel’s father passed away, they decided that Viejo would fit their concept much better. “Viejo Coffee comes from my dad, that’s how they used to call him, so that’s why we named it. We wanted to keep it a very Hispanic Mexican vibe and that’s where it comes from,” De la Rocha said. 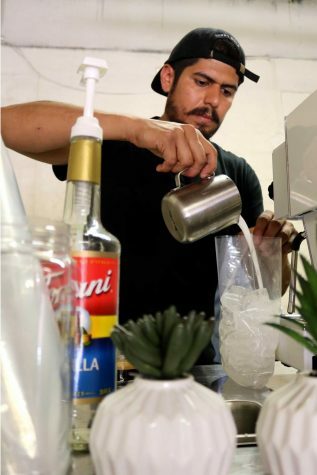 In the last couple of months, Viejo Coffee has been serving the community at different locations around town, and in September they will finally open their coffee shop in the heart of downtown El Paso. Their Viejo Coffee plans on opening up their location in downtown El Paso sometime in September. Getting their products from coffee roasters near the El Paso area, Arevalo said that they obtain their products from a roaster in Marfa, Texas, who brings the coffee directly from farmers in Mexico. 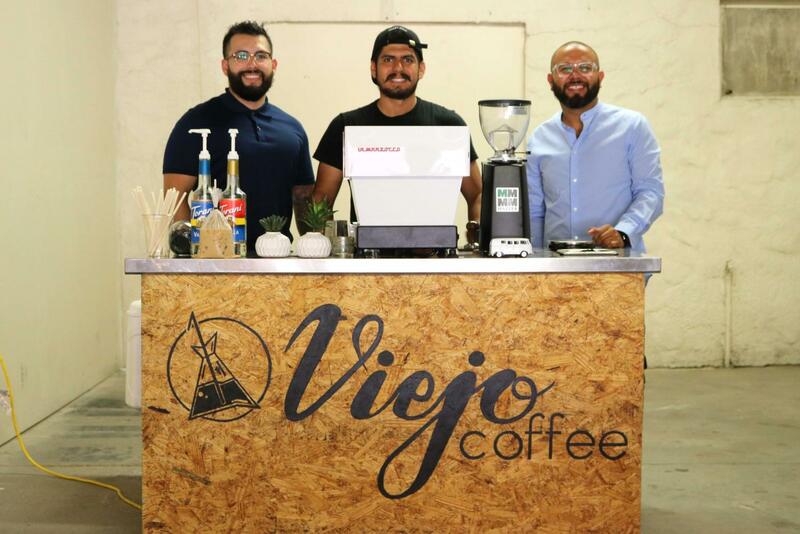 Being from the El Paso area, Silva said that Viejo Coffee is the concept of three friends who are starting this business and going into this venture in their local region. “We just want to give back to the community and just all over town and anywhere we can help this city grow, we’re all for it,” Silva said. For more information about Viejo Coffee, visit their Instagram page @viejocoffee .